How to perform a cleansing ceremony with the use of burning sage, also known as 'smudging'. A smudge stick is a dried and bundled plant. One can also use loose leaves in smudging, but before we get to the particulars of such a ceremony it will help to have an understanding of the origins of this Sacred practice and how it will cleanse, heal, and consecrate an energy field, or thing, or space. People commonly credit smudging as being a Native American practice, but the use of rising smoke in Spiritual Rituals has been practiced across many cultures for thousands of years. The Ancient Hindu texts reveal this was practiced 6,000 years ago with the burning of incense. Smoke purification was performed in Egypt, with the burning of aromatic resins for religious ceremonies. 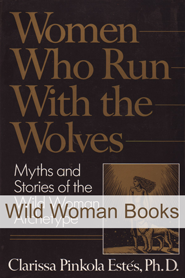 It was practiced in Babylonia, Greece, Rome, Japan, Tibet, China, among the ancient Hebrews, and among indigenous tribal cultures around the world, with the Native Tribes of North America being only a portion. Catholic and Orthodox Christianity, which are an amalgam of pagan beliefs and practices, use incense in religious Cremonies, adapted from the pagan rituals popular when the Christian theocracy was legalized by the pagan-turned-Christian, Roman Emperor Constantine, in 325 AD. So the use of smoke to purify in a spiritual way is not exclusive to the Native American tradition, although we have them to thank for the wonderful and deeply spiritual practice of burning sage and other sacred plants as a purification practice. This tradition is a very beautiful gift and the most effective method commonly used in spiritual cleansing ceremonies today. 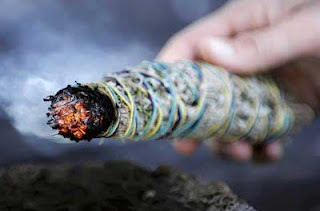 To approach a smudging ritual and to be effective in cleansing away negative energy, one must be reverent of the plant being used and even the energies being cleansed. All energy is divine at its core, whether Light or Dark. Respect for all life is essential to any smudging that you undertake. If you cannot feel reverent about this sacred practice, don’t do it. Find someone who is spiritually qualified and energetically prepared to do it for you. Although many different plants can be used for smudging, indigenous American tribes consider four plants to be especially sacred: sage, sweetgrass, tobacco, and cedar. Each plant is considered to have a special function and this can vary by tribe and tradition. 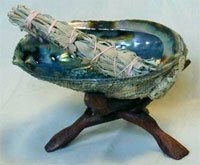 While sage is used for purification, sweetgrass is used to bring in positive energies, and its smoke is considered to carry prayers to the Creator. -If you are feeling down, negative, stuck, or in a spiritual low place, smudging is an excellent way to change things for the better. -When your house, your property, or any place or space has been exposed to heavy and negative energies, or painful experiences and even illness, they should be cleansed with smudge. -When you move into a new location, it should be smudged to cleanse the psychic imprints of previous occupants. -If you feel the presence of bad energy in your living quarters, or if a solitary room makes you feel bad or uneasy by being in there, it’s time to smudge. -If you want to create a protective barrier against outside negative influences, such as neighborhood issues, it’s time to smudge. -If you want to make your prayers stronger and if you want to feel more connected to Spirit, it’s time to smudge. -If your vehicle has been in a fender-bender or you’ve had a close call in your car, smudge it, inside and out, to remove negative energetic imprints that can attract more negative experiences. -Cleanse second-hand items with smudge to remove psychic imprints of previous owners. -You can consecrate and energetically charge your garden by smudging. -You should smudge to clean yourself and your space before engaging in any psychic contact or spiritual ceremony. -You can smudge anytime just to connect to a state of spiritual clarity and harmony! Remember, you “clear the air” in your life with the help of sacred smoke! Important: smudging is the safe/contained burning of the dried sage, cedar, sweetgrass or other plant material so that the cleansing smoke is released, active flames are discouraged, once lit you can blow out the flames and embers will continue to release smoke in a good way - You can use a abalone shell, clay saucers, fireproof glass or other ceramic materials more appropriate for containing burning material. You clear with sage using a feather which represents air, the shell represents water, sage represents Earth and the burning itself represents fire. Traditionally, you would begin by opening a window or door in each room and begin there. This is also where you will end. This is done in each room walking clockwise. With the feather you wave the smoke gently affirming your intentions of cleansing that space leaving only positive energy. We leave a window or door open because the healing properties of the sacred smoke collect and transmute the positive ions and the ions get dispersed into the fresh air . Its what happens during a thunder and lightening storm where the negative ions leave the atmosphere cleansed and refreshed. Make sure to put it all out afterwards - dip in water, or carefully crush out the embers to make sure all the embers are extinguished. 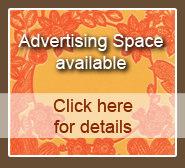 -This is a powerful tool to be used wisely and for the good of All Beings! Buy sage or gather sage & dry it out. If you can go outside, the best is to be on bare feet to connect to Earth, grounding oneself. Remove all metal jewels from your body because it can affect the energy. You can use an (eagle) feather to bring sage smoke towards your eyes, ears, mouth, hands and overall whole body, you can also smudge your feet and back to remove energy. Feel what is needed. Ask Great Spirit to be cleansed and purified from everything that is no longer needed. Take a moment to come at peace and to thank the spirit of the plant. Fill your heart with gratitude. Sacred sage and other wonderful herbs are Earth Mother’s gift, and once you understand how important a tool they are in your own spiritual welfare you will never be without a supply on hand. They are a fundamental part of your spiritual first-aid kit, given by Creation to heal wounds upon the Soul. from the native teachers I have encountered sage is always to bring positive energy into a space and seal it in. Cedar was used to clear out the space first. sage is not for clearing ( in the traditions I have learned). Cedar clears nicely. Frankincense is also a very powerful space clearer.. Each tradition is different. sweetgrass for calling in the guides/honoring them. Sage for insulating and creating sacred space. Cedar for cleaing. Tobacco for offerings and prayers. hi - this is very good info but not very much on the how to smudge part... a couple of important points: smudging is the safe/contained burning of the dried sage, cedar, sweetgrass or other plant material so that the cleansing smoke is released, active flames are discouraged, once lit you can blow out the flames and embers will continue to release smoke in a good way - the picture shows an abalone shell being used to hold it, this is often used but personally I don't feel like burning the insides of beautiful abalone shells are the most respectful to the abalone, so I used clay saucers, fireproof glass or other ceramic materials more appropriate for containing burning material. Make sure to put it all out afterwards - dip in water, or carefully crush out the embers to make sure all the embers are extinguished. Also, very importantly, my teachers have stressed the need (and I have found this to feel and be true) to make sure a door or window open when you smudge in an enclosed space because the smudge WILL disperse bad energies, sometimes very powerfully and they need a place to go - I have heard stories of windows being broken/blown out when a door or window to the outside was not left ajar! Thank you for this article on the reasons for smudging and for adding this important additional information. This is a powerful tool to be used wisely and for the good of all beings! You clear with sage using a feather which represents air.. the shell represents water, sage represents earth and the burning itself represents fire. Traditionally, you would begin by opening a window or door in each room and begin there. This is also where you will end. This is done in each room walking clockwise. With the feather you wave the smoke gently affirming your intentions of cleansing that space leaving only positive energy. Thank you all very much for your comments! We added the 'how' part with some of your words combined with ours. We feel it is complete now.. Stay connected.. Love and Blessings! I genuinely appreciate your piece of work, Fantastic post. I really wish I did this for all the houses I have lived in. I've felt terrible energies that have made me cry, and worse have oppressed me. I'm not sure how to start and have the right reverent spiritual energy. You're right, all cultures are different. In my cultural up bringing I was taught to use sage to clear negative energies and sweet grass to bring in positive energies. I have a granddaughter who has a beautiful spirit, but very negative energy. Is it possible to smudge a photograph of someone if you are not able to be near them. I bought my house in 2015 and 3 weeks later (before moving in) my husband suddenly died. After moving in a month later I started having all kinds of illnesses and accidents happen to me. A severed achilles tendon requiring non-weight being for 3 months that turned into a life threatening infection of the blood, after that skin cancer, broken front tooth requiring implant, my breast implants ruptured, which will require removal, a tumor on a nerve ending in my back and a detached retina in my left eye. I am not a negative person and only list these things to make a point of what has been happening. It came to my attention last night that maybe it is the house itself! i have had spirit trying to get my attention: turning up Pandora music on an iPad that was shut down, turning on computers that were shut down, smoke alarms going off in the middle of the night, etc. I need recommendations from a knowledgeable person on how to stop these negative assaults.